You will have thirty days from the time of shipment to return your ring. This is a no questions asked, return for any reason policy. You will receive a full refund via your method of original payment. Personally engraved items are not returnable and resizing will ruin the engraving. Please be sure to confirm ring size before ordering. Need your ring resized? Click here. If you have paid using the wire transfer method, Danforth Diamond will issue a company check for your refund. The credit will be issued to you within three days of receiving the return. We do not accept returns if another jeweler has altered the item or if it shows obvious signs of wear. Keep in mind some eternity style rings and patterned wedding bands are impossible to resize so be sure to order one of our free ring sizers to confirm your size before ordering. We consider these to be special orders and they are not returnable. 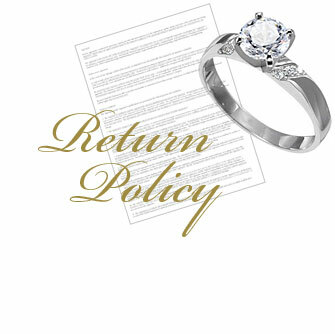 FOR ALL RETURNS and Ring Resizing - Please call us at 1.877.404.RING (7464), to receive a Return Authorization Code. You must have this code to return any item. Call 1.877.404.RING (7464) for a Return Authorization Code. Once you receive this code, write it on the label marked "return" on the bottom of your invoice. Then, cut out the label and tape it on the outside of the box in which you are returning the item. For security purposes, do not write the company name or return address on the packaging. If the list price of the item is less than $500: Ship the item back to us via any carrier you choose. For your protection, insure the package and request confirmation that the package has been received. Danforth Diamond is not responsible for the loss or damage of any items being returned to us. If the list price of the item is more than $500: You must return the package to us via U.S. Postal Service Registered Mail, since FedEx and UPS will not provide insurance on items worth $500 or more. For your protection, insure the package and request confirmation that the package has been received. Danforth Diamond is not responsible for the loss or damage of any items being returned to us. Please be sure to include your name and order number with the return. Once Danforth Diamond has received the returned item, we will examine the item and notify you via e-mail of the status of your return request. In most cases, this notification will arrive within five business days. Please note: We will not accept items that are unauthorized, packaged incorrectly or improperly insured. These items will be returned to you. Additionally, Danforth Diamond will not accept the return of any item that has been damaged, engraved, re-sized or otherwise altered by a third party. Danforth Diamond is happy to resize your ring up or down one full size for free one time after purchase. Some eternity style rings and patterned wedding bands are impossible to resize and are considered Special Order. These are NOT returnable and we are unable to resize them. So please order one of our free ring sizers before ordering to confirm your size. There is a $25 fee to resize your ring after the initial resize. This does not include shipping to and from our facility which will be a $20 charge. To resize a ring, please follow the return instructions found at the top of this page.